YouTuber Eugenia Cooney hasn’t updated her social media accounts for over a week, leading to speculation that she is dead. However, there is nothing to suggest that she actually is. 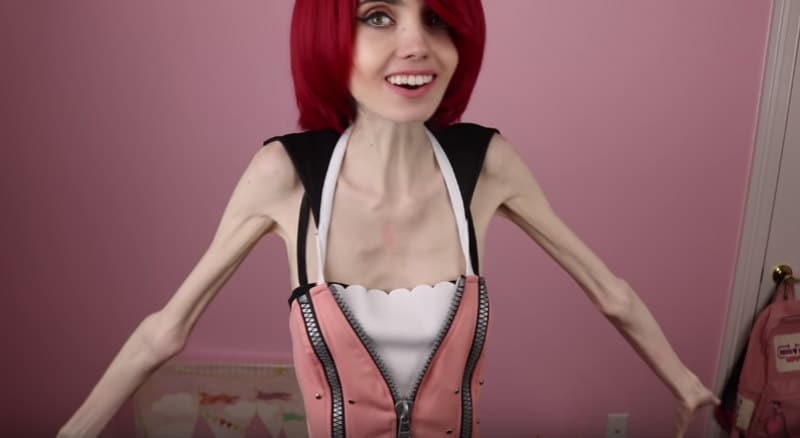 Her last video was another Kingdom Hearts Kairi cosplay and makeup tutorial, but showed what appeared to be dramatic weight-loss — with her bones and skeletal structure clearly visible. Many have speculated that Eugenia suffers from bulimia or anorexia, however she has previously denied any claims that she has an eating disorder. Popular YouTubers including Keemstar, Onision, and PewDiePie have urged their viewers to send her support. @Eugenia_Cooney just reminding you lots of people love & care about you! 🐊💜 swamp family is here for you! After her recent social media silence, many started speculating that Eugenia Cooney had passed away. However, there have been no reports to substantiate these claims. On January 28, Eugenia Cooney took to Twitter to state that she is alive and was surprised to hear rumors about her death. btw I'm so sorry people make up such crazy stuff, but I am alive and definitely not dead. I was really surprised to hear that was going around about me, but everything is fine! However, she hasn’t returned to social media since her last hiatus, which was for about one week — leading to renewed speculation. There have been many debates on social media about Eugene Cooney’s health. There is also a fake document claiming that Eugenia Cooney died at age 24, which helped fuel the speculation about her current status. THIS is the ‘document’ going around that people are saying is proof Eugenia Cooney is dead. There have been efforts in the past to remove Eugenie from YouTube due to fears about her health. Two years ago, a petition garnered over 16,000 signatures to remove her videos from YouTube. According to the National Association of Anorexia Nervosa and Associated Disorders about 30 million people of all ages suffer from an eating disorder in the U.S.
Eugenia Cooney has not released a statement on any of the latest developments.